Instructions: Card base; cut white card stock 12" x 6", fold in half with side fold. Cut a 6" card panel from the Burst of Spring design paper and cut to 5 7/8" square, add to card front. Using the Hand-Stitched frame die, cut from pink card stock. Cut a piece of white card stock 3 3/4" x 5" and adhere to the back of the frame. With the Butterfly Kisses Decorative die, die cut the square frame from blue card stock. Adhere to the front of the frame. Add the frame to center of card front. Die cut doily from Butterfly Kisses die with white card stock. Sponge with Aquamarine. Dab VersaMark ink pad over doily and heat emboss with Shabby White embossing powder. Add to center of frame. 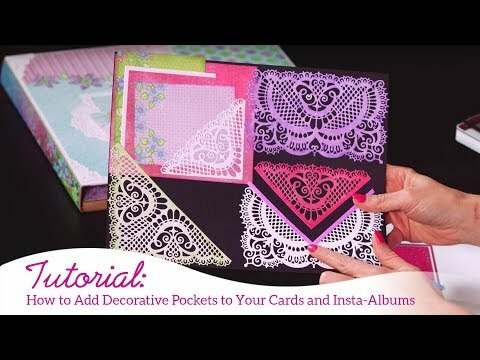 From white card stock, die cut Ornate Pocket Accents die. Die cut trim piece from pink design paper from Wildwood Cottage paper collection and adhere to pocket. From same paper, cut a piece 5 1/4" x 3 1/4". Cut the 'V' to fit the center of the Ornate Pocket. Lace pink ribbon thru center of the pocket. Adhere the pink piece to the back of the pocket and then adhere to card with foam tape. Stamp both Pansy Sprays on watercolor paper with Jet Black. Color with watercolors. Stamp just the center flower from the sprays on white card stock with Aquamarine. Sponge around edges with same ink. Die cut with coordinating dies. Adhere the center flowers with foam tape. Add the floral sprays to card. Add crystal and yellow Stickles on flowers.